My design for the competition is based around a department store. 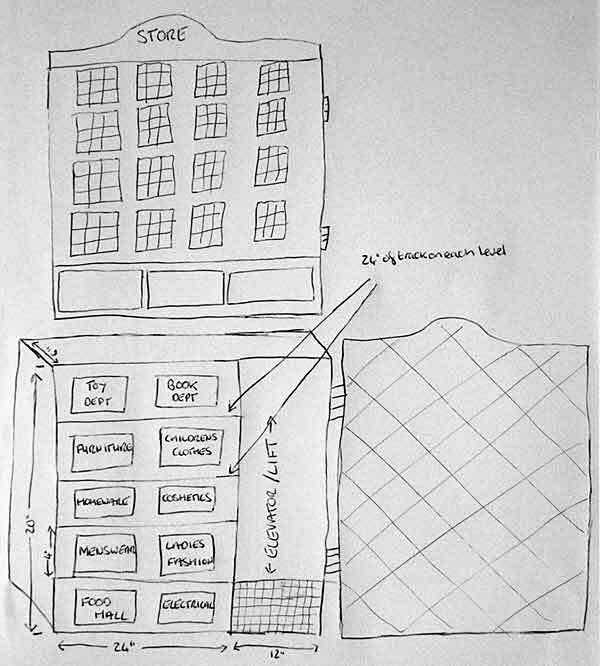 The whole layout would hang on the wall with the outside of the store showing when the layout is not in use. When in operation the facade would swing away on its hinges to reveal the layout. The right portion is a powered elevator which is just big enough for the Trackmobile and a 60′ boxcar. The left portion houses unloading facilities for the ten different departments within the store. The layout would have up to seven boxcars that need spotting to randomly selected departments. Layout depth would be around six inches to allow a little room for modelling interest at the uploading points — fork-lift trucks, unloaders, boxes etc. I have to admit that I haven’t modelled in HO or even US outline — I hope 4 inches high is enough clearance!